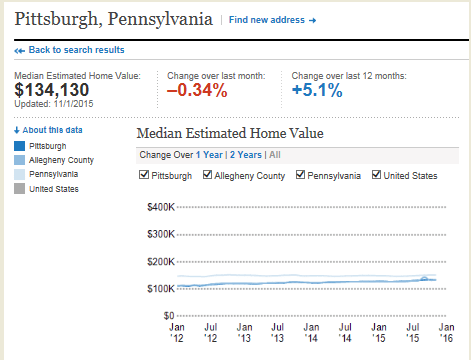 This post and the graphic to the left depicts only the Pittsburgh housing trends and does not include Allegheny County or the region. We all may have heard from various sources that the City is booming and values are skyrocketing. Well, while in some areas that ‘may’ be true, in the City of Pittsburgh as a whole it does appear that last years annual appreciation is slightly higher than usual. in fact one could say, according to historical statistics last years appreciation IS skyrocketing (tongue in cheek). I would like to preface that in this short post, the 3 year graph to the left only runs through October at the time of this writing. As you can see, it is very boring with no real wild swings as in many parts of the country. Although our market does ebb and flow, for the most part, it still seems to be holding true to that conservative 3% per year. This slow but steady rise in appreciation will help us ride out any housing bubbles in the future and as the cornerstone of our region, help the area continue to have a solid footing in this nation’s current and future economy.